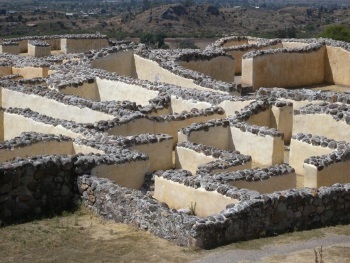 The Prehistoric caves of Yagul and Mitla in the Central Valley of Oaxaca are archaeological sites associated with the Zapotec civilization and much earlier primitive farmers. The area was the "birthplace" of the domestication of plants in North America. The designated area includes Guilá Naquitz, a small cave which was occupied at least six times between 8000 and 6500 BC, by hunters and gatherers. A wide range of plant food was recovered within the cave deposits, including acorn, pinyon, cactus fruits, hackberries, and most importantly, the wild forms of bottle gourd, squash and beans. This was a near miss for me. Given the title (... Mitla ...) and a wikipedia entry which at the time also listed Mitla as part of the WHS I decided to go to Mitla. Only after I had visited the site I decided to read the review on this site by Anthony. He pretty clearly states, that Mitla is not part of the site. I crosschecked with Unesco and found he was right... Luckily, Yagul is on the road between Oaxaca and Mitla and I was able to correct my error by going there. The key feature that made this a WHS is the continuous settlement since very early times and the early cultivation of crops. There are several caves, which show this best. As I had little time, I only visited Yagul. It's a small sight with a distinct feel. I enjoyed climbing the hills around Yagul and the overall view of the valley and the mountains. To go to Yagul, you best take a colectivo from Oaxaca. Near Periferico, ask around and they will point you to a shared cab (less than 50 pesos). The cab will drop you off at the intersection for Yagul and you have a 15min walk ahead of you. Please note, that Lonely Planet has a travel warning for this side road. Not sure why though. To get back, head back to the highway and make wild signals, till a cab picks you up. The plaque is found near the entry to Yagul. Mitla: A nearby archeological site with nice mosaics. Tule: Thickest tree in the world. Former tentative sight. This site is certainly confusing. When you look at Yagul and Mitla either in the guidebooks or on line, the descriptions are that these are two pre-hispanic sites occupied first by the Zapotecs and later by the Mixtecs from as early as 500BC and declined after Monte Alban and abandoned after the Spanish arrival. 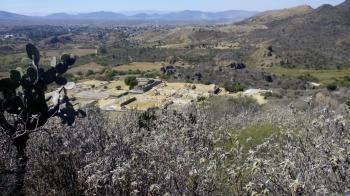 Both sites are in the Tlacolula Valley south of Oaxaca. There is little to see in Yagul but Mitla claims some really nice mosaic works on the walls of the palace. Some of the frieze are made up of over 100,000 separate pieces of cut stones. In fact, the church that was built on the site uses a lot of the Mitla mosaic works and the walls are the original walls from Mitla. The picture on this page comes from the palace walls in Mitla. The problem is that the description of this site on the UNESCO web page hardly mentions these two pre-hispanic archaeological sites other than in passing. The criteria for this site are the caves in which a lot of work has been done to establish that these caves had evidence of the first domestication of corn and other crops on the continent and therefore the beginning of transformation from nomads to building cities in MesoAmerica. It could also be that Mexico had a lot of pre-Hispanic sites already and to get this site they emphasized the pre-historic part of it. The problem is now to determine what are the boundaries of this site. If you go to the UNESCO site and downloaded the map, you will find that the core and buffer zone lies south of the town of Tlacolula and north of Mitla on the east of the highway 190. The archaeological site of Yagul is in the core zone but the archaeological site of Mitla is neither in the core or buffer zone as it is in the middle of Mitla town center. So if you visited just Mitla, you missed this one. The next problem is how to visit any of the caves. There are no information available on line and it is a challenge to get any relevant information at all. After asking around, I located a guide from the town of Tlacolula who specializes in the cave tours who spoke excellent English and so we set off. We decided to concentrate on the Cabalito Blanca Mesa as it seems to have the best concentration of caves. The first stop was to view prehistoric art of a candelabra cactus 3m high 20m up the cliff side. Very nice and this can be seen from the highway if you know where to look. Then we climbed the mesa and walked among the agave plants and saw the remains of a Zapotec observatory similar to the one at Monte Alban pointing towards the sunset in the valley. After climbing back down to the valley, we started approaching the caves. The caves are in a row half way up from the valley. The valley used to be a lake and so it makes sense for the shelter to be on higher ground. The problem is that there are no paths up to the caves and they are about 20m up. The vegetation is shoulder high of cactus, thorny shrubs and dried grass. We had to just push our way through and it was not long before my arms were bleeding from the cuts and the cactus thorns were all over your legs and clothes. The caves are interesting in that they are deep overhangs on the cliff side and the roofs are black from soot from fires in the past. The floors are sandy and I believe that is where they found the evidence of crops from pre-history. The view from the caves to the valley floor is spectacular. However after the third cave, I said enough as the going was much tougher than expected, so we came down. None of the caves are fenced and I assume that the vegetation is a natural protection. You can also only do this doing the dry season as it gets very muddy in the wet season. After we got back to our hotel, my wife and I spent the next hour pulling thorns from our hands and legs. ICOMOS advised Referral to "Define a much smaller area etc"